I am a perfectionist when it comes to any projects I work on. I have a clear vision on what my deliverable will look like and I find myself to be uneasy until it gets executed perfectly. One thing I have learned from being a mom of twins is that there are times you need help to execute your vision and it’s okay to ask for assistance. Unlike most mom’s, I started planning my twins first birthday a month before the big day. Why so late? I was nose deep working on getting my house set up for the holidays and ready to host my annual Christmas Eve dinner. Every year, we have a huge get together at my house from my husbands family on both sides of the border. One thing I’ve learned with motherhood is that you can have it all, but you also need to learn to prioritize what’s important and teach yourself that it’s okay to delegate the rest. Hence, reaching out to my friend Wassal from Petals and Pearls. 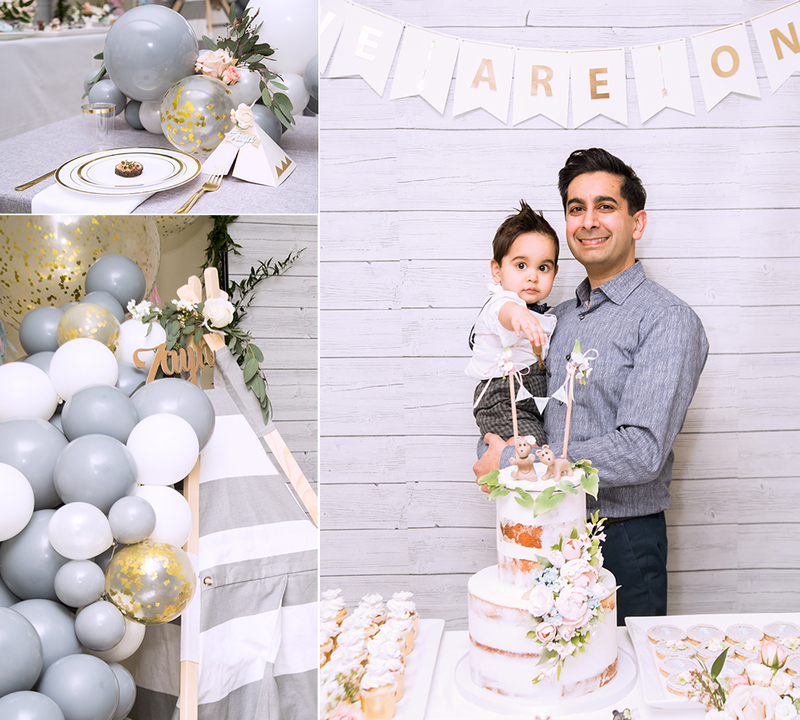 Because this is the first of many birthday’s my son and daughter will celebrate together, I created a Pinterest board containing ideas that was perfect for both genders that covered decor, cake designs and entertainment that was perfect for indoors. I made sure the board was streamlined to contain only ideas that I wanted to incorporate for their birthday with additional notes containing specific details (like color). Having this board with my notes made it easy for me to communicate with my party planner, Wassal, friend and founder of Petals and Pearls. By the way when I was collecting images that I was drawn to for the twins first birthday, I can’t tell you how many times I secretly wished we lived in LA so we could host it outdoors. Half my Pinterest board was filled with pins that involved being outdoors with teddy bears (their favorite stuffed animal) and picnic bench inspired table settings. Oh well, living on the east coast where we get an insane amount of snow and having a fully done basement that is both spacious and never gets used, Wassal suggested it was the perfect venue for the twins birthday. And she was right, the space was more than perfect to accommodate 72 guests to wish the twins a very happy first birthday. Last month I posted a cute photograph of Zayn with his favorite teddy bear. It’s the only bear that both brother and his sister haven’t covered it with slobber. It’s also the only bear that I couldn’t get two of and both brother and sister have learned to share it and also take great care of it. 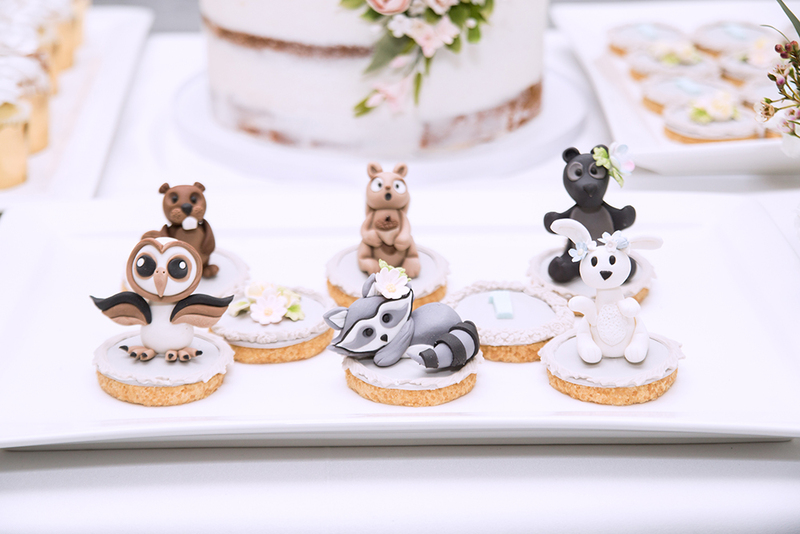 So it was natural we went with a woodland theme and had two cute bear cubs as their cake topper with an adorable banner. To go with the woodland rustic vibe, we had Zehra from Fine Cakes by Zehra make them a naked cake. One thing you should know about me by now, I’m a sentimental mush-ball at the core. I still have the birthday balloons (completely deflated now) my husband gave me when we were dating. They are tucked away in my office and even though I know I will never use them, I can’t bring myself to throw them out. So for the twins birthday cake, I requested Zehra to make the same cake we had for our wedding, lemon with blueberries. Zehra and Wassal suggested adding a wide variety of desserts for their guests, from custom made blue donuts with edible glitter and pearls, to 3-D cookies with the cutest woodland animals, the most delicious cakepops I have ever dug my teeth into, decadent and beautifully decorated cupcakes and the yummiest soft pink macarons I have ever eaten. Everything Zehra made tasted amazing and we had guests coming back for seconds, thirds and one particular friend indulged in six cakepops, two donuts and two healthy slices of cake. For decor, we decided to go with a grey and white color palette that complimented their favorite reading space, the tepee. 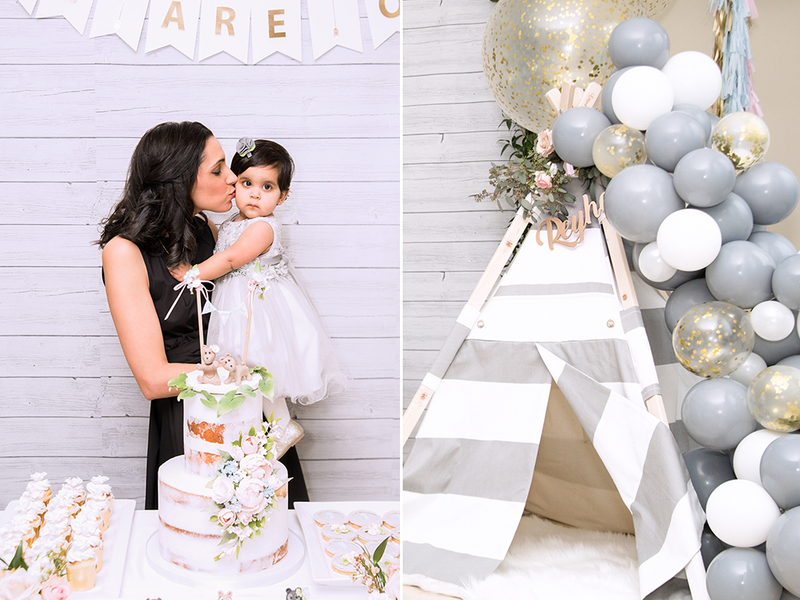 Because our party planner has an identical tepee, she came up with a brilliant idea to setup a tepee on both sides of the dessert table surrounded by grey and white balloons with a sprinkle of gold confetti balloons. 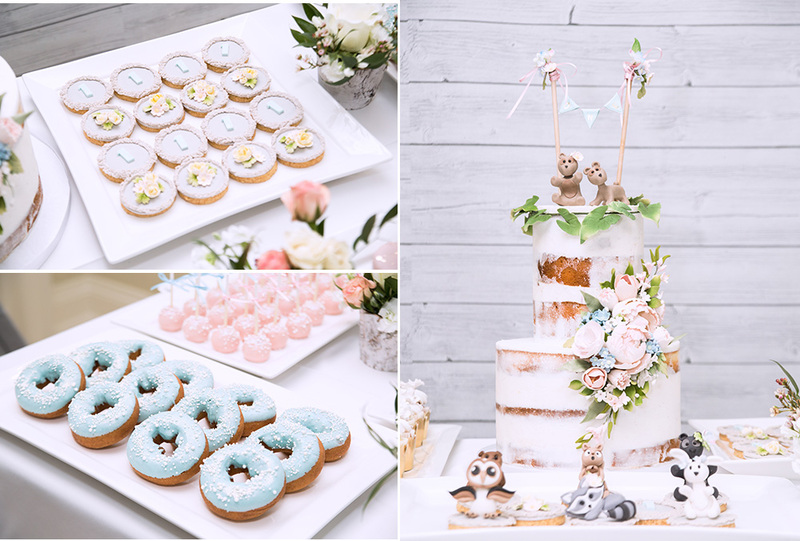 The result, a whimsical and elegant birthday that everyone fell head over heels in love with. Plus, I love the personal touch she added by hanging their name on each tepee to create a his and her section. What do you do when half your guest list are kids? 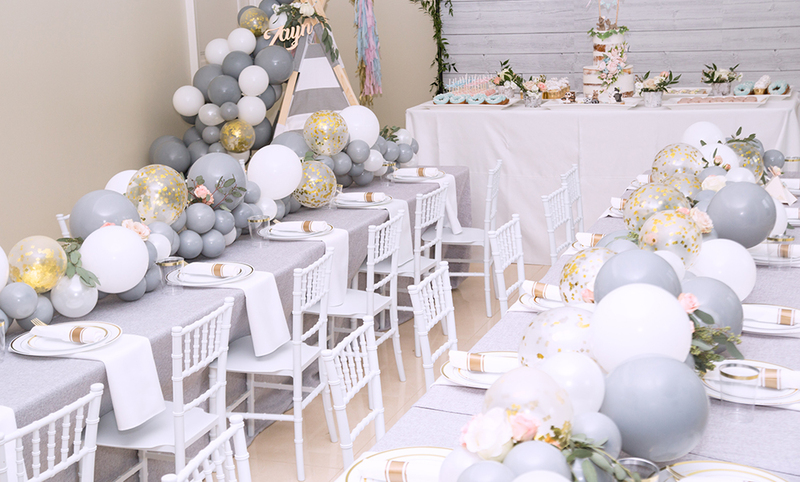 You get the cutest set of tables and chairs that’s perfect for them and have balloons as their centerpiece that trails down the table. And oh boy did it turn out great! It looked perfect with the gold and white place setting we had setup for the kids. 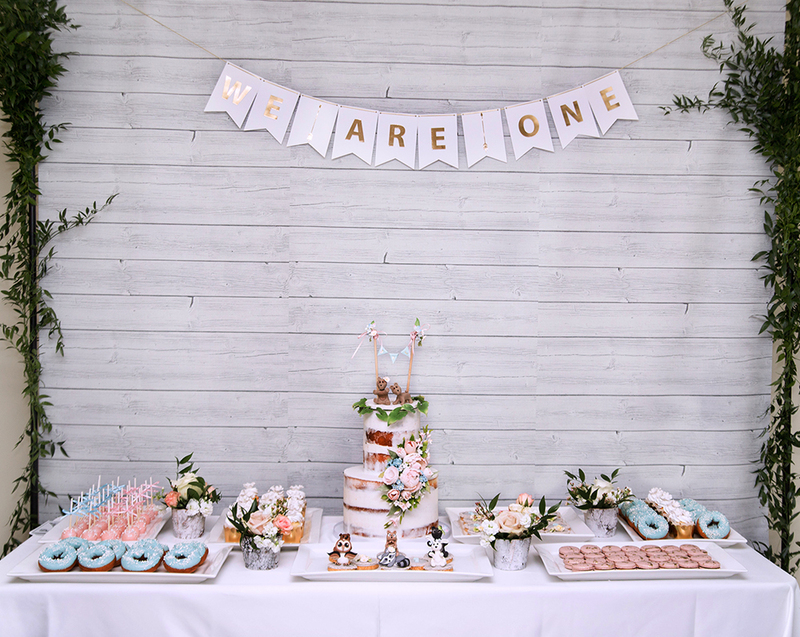 Because we had this setup in the basement, we wanted to have a perfect grey backdrop for the dessert table (created by Event Graffiti) and a sign that can be used for many birthday’s to come….since the twins will be sharing all their birthday’s, we had The Paper Boutique create a ‘WE ARE ONE’ sign. For entertainment, we did things a little different. 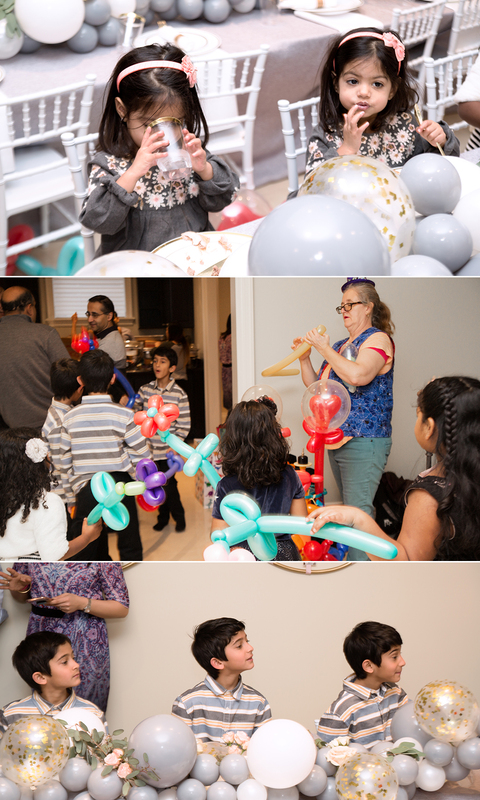 I knew the twins were not a fan of having their faces painted (but I’m slowly working my way to it for future birthdays), and I knew all the children attending the party would be tempted to play with all the balloons around the tepee and table….so we hired a balloon twister. Best decisions ever! She created the most amazing creatures for all the kids and was super fast and twisting colorful balloons into the most amazing things. She made the cutest palm tree with some coconuts dangling on it and a little monkey climbing for it for Reyha, and the most wicked awesome Spiderman for Zayn. All the kids at the party had a blast playing with their balloon created wands, tall flowers or cute inflated pets that they are begging their parents to adopt. Disclaimer: This is not a sponsored post. 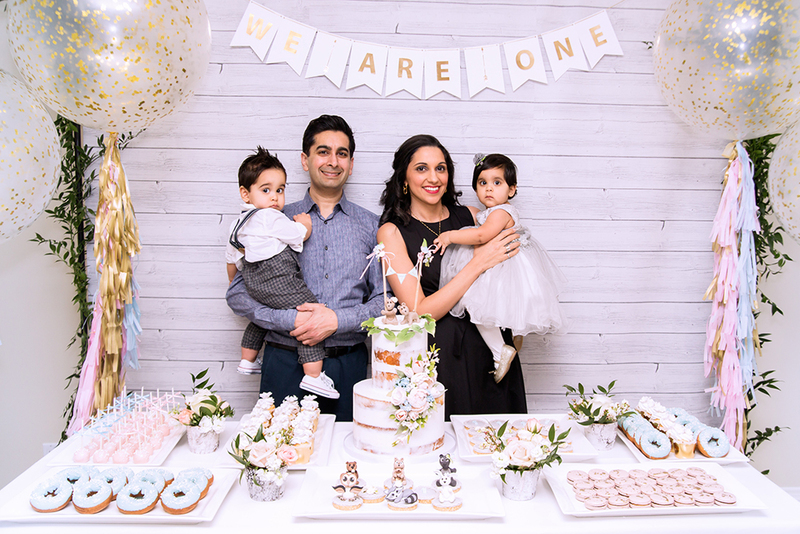 All aspects of this party was paid by my husband and I. I want to thank everyone that got involved in putting this event together under short notice and putting together the most perfect first birthday party for my twins. Oh my gosh, how cute are Reyha and Zayn?! And what a gorgeous soiree you threw for them – it looks better than any birthday party I have ever had haha! Thank you Monique! We had an amazing party planner put the event together and she blew all our expectations!! Reyha and Zayne are super adorable and growing too fast! What a gorgeous setup dear! Their cake is fantastic, truly whimsical indeed! Thank you so much Jessica!! The cake was so beautiful and tasted amazing!!! What a beautiful cake and party! So blessed family! Thanks for sharing!